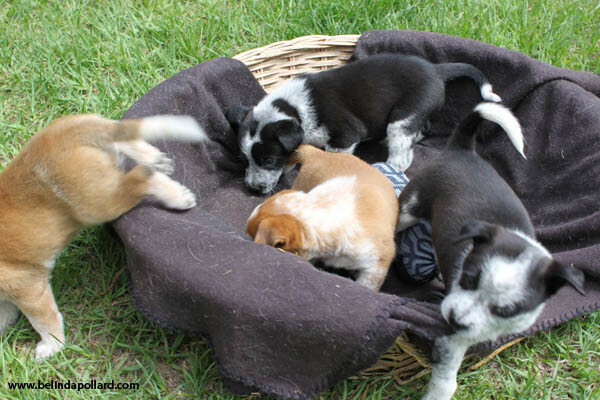 OK, now I know I’m supposed to blog Something Meaningful, but I have Puppy Brain after nearly six weeks of assisting my mother’s border collie with her first litter. I have had about 45 minutes sleep since October. And so I’m going to post some gratuitous puppy photos instead. Yes, I know I look awful, but I’ve been up all night with a nervous, labouring dog. And I have a handful of Adorable, so look at that instead. This makes this story a bit of fluff. Literally. 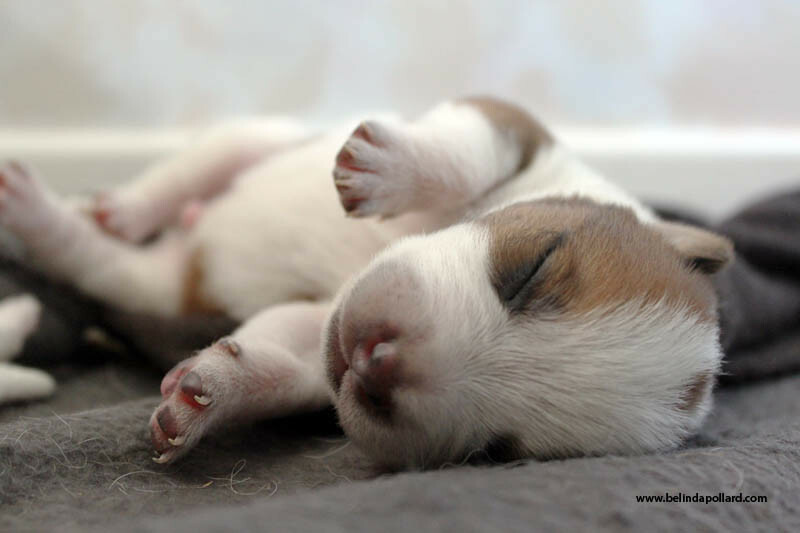 We have sleeping puppy photos, eating puppy photos, even cute-pink-puppy-toe photos! Actually, maybe we’ll call it a Photo Essay. Does that make it sound more Serious? Here we go. 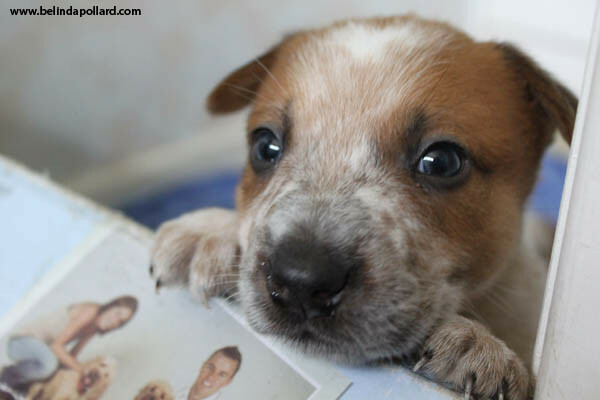 Get your “Awwwww” ready. 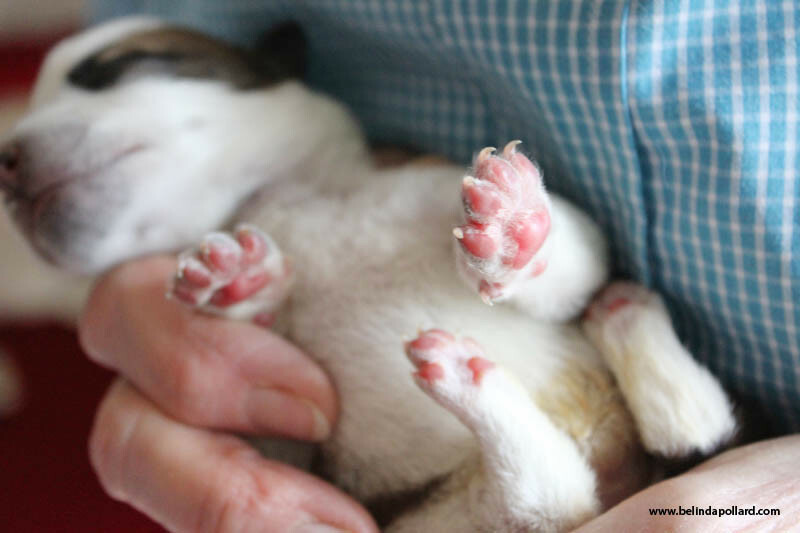 Puppies are born with PINK TOES! Who knew????? 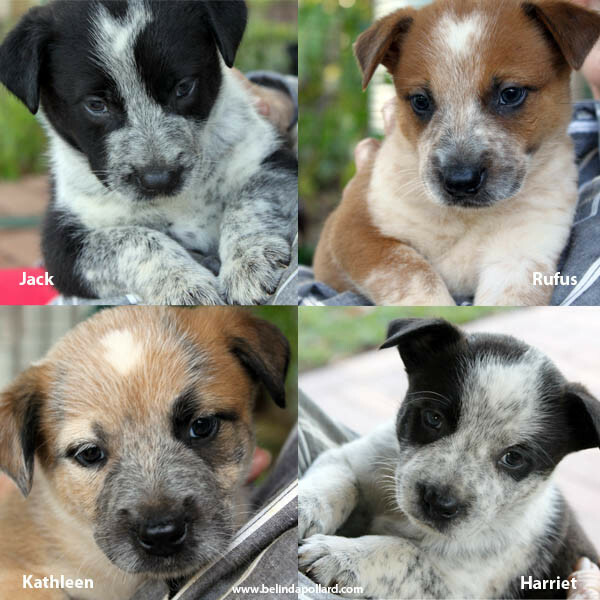 Where to put puppies when the weather has suddenly turned cold for this time of year? How about the little downstairs bathroom? And we’ll fold up a cardboard box to make a barrier to keep them in. That should do it! How many puppies will fit in a box? 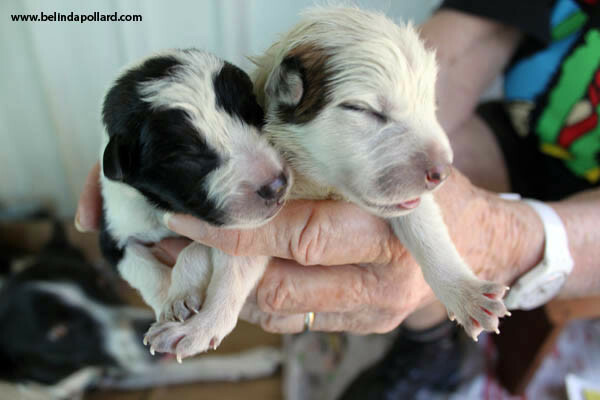 At two days old, we take the puppies to the vet for their check. 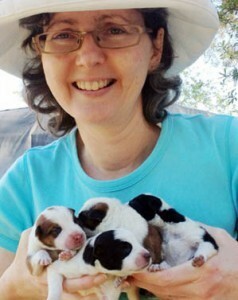 How do you transport four squirming teeny tiny pups? How about a cardboard box? And, I know, let’s photograph them in the same box every week, just for fun! Um, yeah. Don’t think we’ll try for a Week 5 photo. Ok, let’s organise the Waggle Mafia for a team photo. 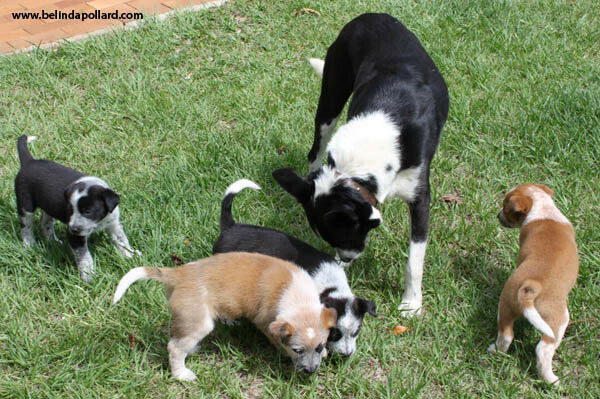 We need a photo for the ad, and we really do need four puppies in a row. All looking at the camera. How to do it? Maybe if we put them with their mother… she might organise them. Hmmm. Well, that wasn’t very successful. Let’s try something else. Another failure. How about the basket. They’ll all sit in that and look at me. Surely. So tell me, what do you think of our puppies. Adorable? 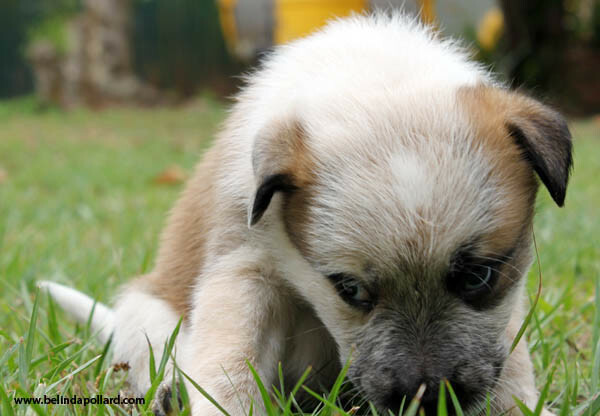 What is your experience with small dogs, or indeed any other young animals?! My pancreas just shut down. Tooooooo cute! Those puppies are so adorable. I have never forgotten the time we had to hand feed a littler of potential guide dog pups because the dam got mastitis. It was so rewarding but absolute chaos and sleepless weeks. i also raised a kitten from two weeks of age after rescuing him from inside a wall cavity. He’s my baby. Thanks for also sharing the photos of your dog Rufus dancing. Exquisite. Dionie, I can’t imagine hand feeding for weeks! 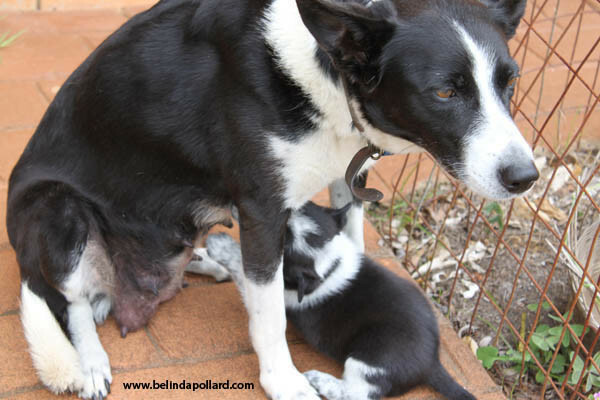 Just feeding solids was so much work, even with the puppies’ mother doing her bit. And your cat too… sounds like you have a gift for hand-raising young animals. 😉 Thanks for stopping by. Yes beautiful puppies but they are just dogs ladies. I see I am the only male to repond to the puppy photos. I am also an ex-farmer, enough said. I am here to thank you for your excellent contribution last night to the seminar “Going it alone” Thank you very much I enjoyed it immensely and learned a great deal. Ah, puppy brain. I know it well. For the past seven weeks or so I’ve been helping my mother-in-law out with a litter of English Mastiffs. And there are THIRTEEN of them! But nothing beats being climbed on and kissed by thirteen squirmy puppies all at once. Omigosh. THIRTEEN! Just four is producing Pupmageddon in our lives! 😉 Chaos reigns. But yes, the joy of puppy cuddles is the compensation for all that. Thanks for visiting, Zoe, and I hope your little tribe continues to flourish. Oh, Belinda! Your photos are gorgeous and made my Thanksgiving day. Thank you so, so much for sharing. Love seeing this picture of you and also … um …if I lived closer I’d come get Harriet, Frank so needs a playmate. You are a precious friend! Thanks Molly, I’m glad it gave you a little lift. 🙂 Harriet would LOVE to come see you and Frank for the Extended Sleepover, if that darned customs/immigration thing wasn’t standing in her way. 😉 She is so smart, she could probably travel as an unaccompanied minor, too. I’d need to make the online booking for her though, as she has trouble typing with those cute soft furry little paws. They are so adorable and precious! *Swoon* 😉 Between their lovely dam and you, I bet they are four of the best cared for, well socialized and happy, balanced pups EVER! Thank you for sharing this photo essay! THEY ARE BYOOTIFUL! 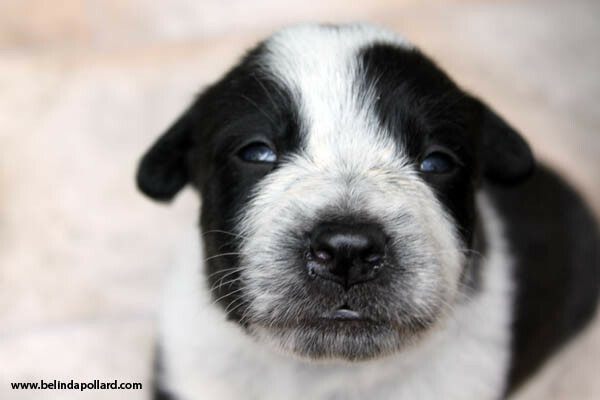 They are growing bigger… and their eyes are open! They’re ready to play with! I wish I was there!